I read this article and found it very interesting, thought it might be something for you. The article is called HIMSS19 Day 1 Announcements & Summary and is located at https://hitconsultant.net/2019/02/11/himss19-day-1-announcements-summary/. (HHS) today proposed new rules to support seamless and secure access, exchange, and use of electronic health information. The rules, issued by the Centers for Medicare & Medicaid Services (CMS) and the Office of the National Coordinator for Health Information Technology (ONC), would increase choice and competition while fostering innovation that promotes patient access to and control over their health information. The proposed ONC rule would require that patient electronic access to this electronic health information (EHI) be made available at no cost. For the first time, CMS is now proposing requirements that Medicaid, the Children’s Health Insurance Program, Medicare Advantage plans and Qualified Health Plans in the Federally-facilitated Exchanges must provide enrollees with immediate electronic access to medical claims and other health information electronically by 2020. Apple today announced that the Health Records on iPhone feature will be available soon to veterans. For the first time, American veterans receiving care through the Veterans Health Administration will be able to securely view their aggregated health records directly in the Health app on their iPhone. With Health Records on iPhone, veterans across the US will be able to see medical information from participating institutions — including the VA — organized into one view all in the Health app. Health records data includes allergies, conditions, immunizations, lab results, medications, procedures, and vitals, and is displayed along with other information in the Health app like Apple Watch data. This means VA patients will get a single, integrated snapshot of their health profile whenever they want quickly and privately. All Health Records data is encrypted and protected with the user’s iPhone passcode, Touch ID or Face ID. HIMSS Analytics/KLAS Survey: Are EMRAM Stage 7 Physicians More Successful? The last 10 years have seen a dramatic rise in the adoption of health information technology—as well as a dramatic rise in physician frustration with this technology. What about the organizations that have reached the peak of EHR adoption: HIMSS EMRAM Stage 7? Are their physicians more or less frustrated? To answer this question, KLAS (in cooperation with HIMSS Analytics) has used the public reporting of Stage 6 & 7 hospitals in the US to see whether there is a correlation between HIMSS EMRAM stage and EHR user satisfaction. – The good news for an industry working toward ubiquitous, full EHR adoption is that physicians who have the full toolset are more satisfied overall. – Physicians at Stage 7 report deeper adoption of EHR personalization functionality as well as better teamwork between clinicians and IT personnel. Rock Health releases results from their annual national consumer survey (2018 data) on digital health adoption and sentiments. Adoption continues to rise while consumers leverage digital health tools to address concrete health needs. 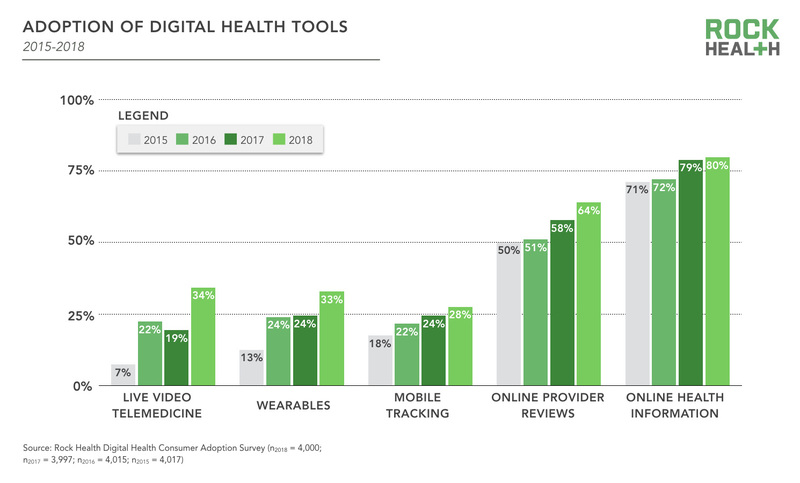 – Eighty-nine percent of respondents used at least one digital health tool—up from 80% in 2015. Live video telemedicine and wearable adoption rates surged following a pause in growth in 2017. Meanwhile, respondents were increasingly guarded about their personal health data—in 2018, respondents were less willing to share data with highly-trusted entities like providers and insurance companies compared to 2017. – In 2018 the tides of wearable usage changed dramatically—respondents reported using wearables to manage diagnosis and using them less to motivate a physically active lifestyle. – Monitoring physical activity remains the top reason for wearable use, but only 44% of wearable owners cited physical activity as the top reason for their wearable use, down from 54% in 2017. – In 2018, 39% of wearable users stopped using their wearable, marking a substantial jump from 27% in 2017. The College of Healthcare Information Management Executives (CHIME) today launched CHIME Innovation to facilitate the creation and adoption of health IT innovation and to improve health and care globally. CHIME Innovation will offer workshops, summits, events focused on the intersection between CIOs and chief innovation officers, and opportunities for CHIME members to share their innovation success stories. Human API, a San Mateo, CA-based health data network has raised $10 million in funding from new investors Guardian Life Insurance Company and SCOR Life and Health Ventures, as well as returning backers BlueRun Ventures and Max Levchin’s SciFi VC. The company plans to utilize the latest round of funding to accelerate product development and market expansion. Human API’s data platform allows users to access, centralize and share their health data from a rapidly expanding network of the nation’s leading electronic health record (EHR) vendors, labs, pharmacies, wearable devices, and health apps. The U.S. Department of Veterans Affairs announced it has completed more than 1 million video-based telemedicine visits in fiscal year 2018, up 19 percent year over year. From October 2017 through September 2018, the VA engaged in a total of 2.3 million telemedicine encounters. About half of those encounters (1,074,400) involved real-time video telemedicine encounters. The remainder involved monitoring, screening or assessing patient data and images. Providence St. Joseph Health has acquired Lumedic, a next-generation revenue cycle management platform based on blockchain technology. Providence St. Joseph Health will be the first integrated provider-payer system to establish a scalable blockchain platform to transform claims processing and enhance interoperability between providers and payers. Financial details of the acquisition were not disclosed. Nuance announced their vision for the Exam Room of the Future, powered by what they’re referring to as ambient clinical intelligence. This new, disruptive AI innovation from Nuance will power the exam room of the future and reinvent the doctor-patient experience in healthcare. Live, from booth #3345, Nuance will offer HIMSS attendees a first-of-its-kind opportunity to experience an enhanced provider and patient interaction, where human conversation moves to the forefront; information retrieval is simple; intelligence is automatically delivered at the point of care; and, clinical documentation writes itself, all within the electronic health record (EHR). Francisco Partners (“FP”), a technology-focused private equity firm has acquired Qualcomm Life, Inc. a wholly owned subsidiary of Qualcomm Incorporated that offers end-to-end medical device connectivity across the continuum of care. As part of the acquisition, Qualcomm Life will be separated from Qualcomm, be renamed as Capsule Technologies, Inc. (“CapsuleTech”), and continue operating its two distinct business segments: Capsule (a leading provider of medical device connectivity solutions for hospitals) and 2net™ (a medical grade mobile connectivity platform). Cerner unveils Chart Assist, a new AI-enabled workflow, to join a suite of solutions designed to reduce physician burnout, enhance the clinician’s experience and increase productivity. Change Healthcare today announced free clinical data interoperability services for the healthcare industry. The foundational, infrastructure services, namely record locator service, identity management, and document retrieval solution with the protection of patient privacy, support a comprehensive range of use cases. The interoperability services will run on the secure, scalable, and agile Amazon Web Services (AWS) Cloud, providing Change Healthcare with the ability to support better health outcomes, and transparency for patients and clinicians at scale across the United States. Bon Secours Mercy Health has renewed and expanded its partnership with Premier to support its efforts to further innovate, grow and deliver excellent care. The PremierConnect data warehouse and analytics platform will be deployed across Bon Secours Mercy Health’s facilities to integrate and align its people, processes and technologies. This includes Premier’s enterprise-wide operational, quality improvement, service line, labor benchmarking and supply chain analytics, as well as a dedicated team of subject matter experts and Premier’s newly-acquired clinical decision support capabilities that will be embedded inside Bon Secours Mercy Health’s EHR workflow. Imprivata announced a partnership with Google Cloud to enable Chrome devices to work seamlessly with Imprivata OneSign, a single sign-on and virtual desktop access platform for healthcare, eliminating the need for healthcare practitioners to repeatedly type usernames and passwords. With Imprivata, practitioners can simply tap a badge to access their Chrome workstation and get instant access to virtual desktop environments including Citrix and VMware. In addition, automatic sign-on to G Suite enables seamless access to office productivity and collaboration tools, and organizations benefit from faster boot times and multiple layers of security with Chrome OS. Salesforce announced it is expanding its healthcare offering, including new innovations that bring Social Determinants of Health (SDOH) data to caregivers on a single platform, tackling a key gap in modern healthcare. Salesforce Health Cloud can now easily capture SDoH data and consolidate it in a single view of a patient, allowing caregivers, home health providers, and payers to collaborate on a single platform. And with new updates to Marketing Cloud, care providers can improve engagement with patients. These features work to improve healthcare through connected, intelligent patient engagement. SAP today announced findings from a commissioned survey of healthcare executives conducted by Porter Research on behalf of SAP. The December 2018 survey polled 100 healthcare CEOs, CFOs and CIOs to delve deeper into their key issues for health systems and how they will prioritize new technology investments over the next three years. – In 2019, health systems will focus on addressing cost pressures, largely stemming from declining reimbursements, along with improving the patient experience as consumerism continues to intensify. – Health system executives believe that the keys to reducing costs and improving patient experience include strengthening operational efficiencies, enabling interoperability, increasing visibility into data and improving patient engagement. – Health systems are investing in solutions to support financial departments, improve patient engagement, allow interoperability and provide visibility into data across the enterprise. Spok Care Connect launched a cloud-native enterprise communication platform that was designed alongside clinicians and IT professionals at hospital and health systems over the past few years. The platform includes a fully integrated healthcare contact center, clinical alerting and alarm management solution, and a multi-device application for care team messaging. Spok Care Connect makes care collaboration easier by connecting important care team and patient information into messaging and alerting applications. The first phase of Spok Care Connect is already implemented by two customers, Peninsula Regional Medical Center (PRMC) and Vail Health. Lumere, Inc., a Chicago-based provider of evidence-based analytics and services to reduce unwarranted and costly clinical variation, announced today the closure of a significant round of funding led by Heritage Group. The additional capital will be used to develop and further expand service offerings that enable evidence-led change at health systems nationwide. Medfusion, a provider of patient data connectivity solutions, announced a new partnership with Healthdom to improve patient health record retrieval and aggregation. In the new engagement, Medfusion’s Data Service APIs will be leveraged on Healthdom’s preventative healthcare platform to enrich patient data sets and provide the most complete patient view possible, in order to identify potential health issues and improve outcomes. Zynx Health, a provider of evidence- and experience-based clinical improvement solutions, today announced that Einstein Healthcare Network, a leading academic healthcare system serving the communities of Philadelphia and Montgomery County, PA, is implementing Zynx Health solutions across its enterprise. The unified solution will offer a streamlined framework for managing evidence-based clinical decision support throughout their organization. Einstein Healthcare Network includes three hospitals with more than 1,000 beds, 11 outpatient centers, 42 primary care practice locations, and 8,500 employees. NextGen Healthcare, a provider of ambulatory-only technology solutions, and Availity, a large real-time health information network, have collaborated to offer clients NextGen® Pre-Service Solutions. With the integration between NextGen® Enterprise PM and Availity, NextGen Pre-Service Solutions arms staff with real-time access to data, including insurance benefit verification, cost estimation, patient financial scripting, address verification and payment options. This more efficient approach to pre-service registration, supported by improved technology, will enable providers to meet the demands of the new, consumer-focused healthcare environment. PointClickCare, the leading cloud-based software vendor for the long-term and post-acute care (LTPAC) market unveiled Harmony by PointClickCare that will enable acute and post-acute providers to eliminate data silos between care partners and leverage meaningful insights. Harmony by PointClickCare connects acute and post-acute care providers on a secure, simplified, and integrated platform. Twistle announced the deployment of its patient engagement platform by Providence St. Joseph Health System for surgical episodes of care, as well as the results of a pilot study that point to improved outcomes for patients. Fourteen hospitals across the PSJH health system have decided to deploy Twistle for use in spine surgery, joint replacement, colorectal surgery, bariatric surgery, cardiovascular and OBGYN following in-depth technology selection and pilot testing. MediQuant, a provider of enterprise active archiving solutions to hospitals and health systems has acquired DataEmerge, a data extraction service and long-time cooperative partner with MediQuant in supporting speed to value for clients. The acquisition will add tools, resources, and capabilities, making MediQuant one of the only companies to offer complete in-house extraction services, while continuing to have DataEmerge serve others in the industry. Pegasystems announced a new survey data revealing the positive impact of quality patient engagement. Sixty-five percent of consumers agree that communications from their doctor’s office motivate them to take action to improve their health, and nearly half responded similarly regarding their primary health insurer. To continue this positive impact, the industry needs to understand how to best engage with individuals for better health outcomes. – Nearly all business decision makers (BDMs) believe they are succeeding in their engagement programs; however, only 35 percent of consumers feel highly valued by their doctor’s office and only 20 percent feel the same about their primary health insurer. – While 50 percent of consumers believe their doctor is readily available, nearly one-fifth disagree or strongly disagree. Care providers, in particular, need to take note – nearly 80 percent of patients would find a new provider after a poor experience. – When it comes to collaboration, nearly one-quarter of consumers do not believe their insurer and doctor are closely connected. This is in direct contrast to what BDMs believed, with 93 percent claiming their organization works with all segments of the healthcare ecosystem to provide seamless experiences. – 42 percent of consumers are comfortable with doctors using AI for care decisions (29 percent are comfortable with insurers doing so). Also, nearly one-third (31 percent) are comfortable with insurers using AI-supported chatbots to answer questions online. – As for virtual care and data access, 55 percent of consumers are open to virtual appointments, 58 percent are willing to give doctors access to mobile health app data, and 60 percent would give doctors real-time access to information via connected devices (37 percent for insurers). Vitalic Medical partners with VivaLNK to detect early signs of patient health deterioration and risk of falling. This unique platform captures human vitals and biometrics, and delivers data from the patient to edge computing devices, as well as to the cloud, for application integration and analysis. HealthSteps, an emerging mobile health company offering innovative digital solutions to improve health services delivery and clinical research, announced a collaboration with the American Medical Association’s Integrated Health Model Initiative (IHMI). Data models developed through the IHMI collaboration serve as a clinically validated data portability standard used by devices to define what data to collect, select how to represent the collected data, and determine how to encode the data for easy transmission, exchange, and retrieval.